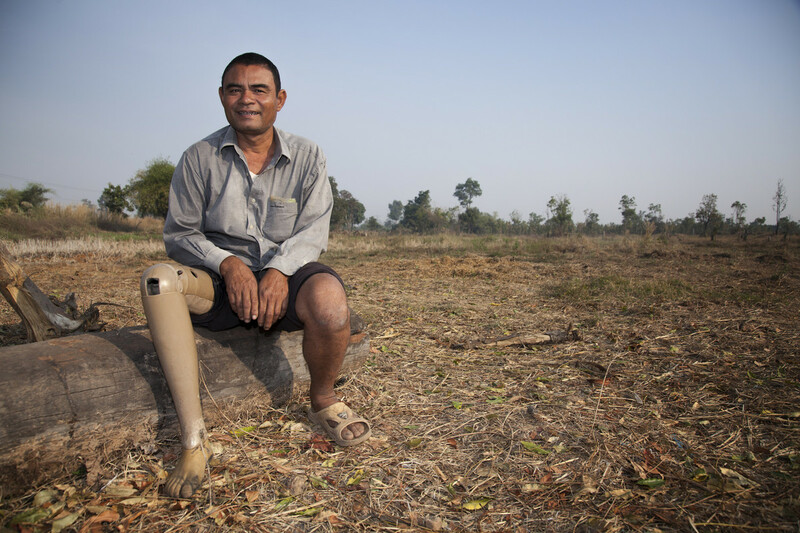 A former soldier recounts how he lost part of his leg when he stepped on a landmine. I am Lann Sa and I am a farmer at Khnar Phtuol, near Siem Reap. Twenty-five years ago I was a soldier defending our village against the Khmer Rouge. One day whilst on patrol I stood on a landmine that the Khmer Rouge had laid. I heard a loud crack and I fell over, then my comrades were shouting and screaming above me before I blacked out. I woke up in the hospital to find that I had lost my lower right leg. I was devastated. For some years I was recovering. Not just physically but mentally. To lose a leg is no easy thing, especially when you need to be strong and physical for a living. Worse, the landmines were still lying hidden around my home and the fields of the community. We were terrified. Eventually I met my wife and started a family, and they gave me something to work for. I learned better how to cope with only one leg, and a local charity gave me good crutches. I was able to farm well; I could plant rice, cut wood, and harvest the crops. But the landmines were still there, and my kids were growing up. They began helping with work, and playing in the fields. We knew the dangers but what could we do? We had to survive. Accidents happened. A child in our community lost an eye when he found an old bullet and began to polish it and it exploded. And we lost many of our precious cows and goats to landmines. Then we heard about an organization called The Cambodian Mine Action Center (CMAC) who were clearing away the landmines and slowly working their way towards us. We were so happy about this and couldn’t wait for them to arrive. To our surprise, they turned up with a team of rats that they said would help find the landmines for them so they could get the mines out of the ground and destroy them. They said they were called ‘HeroRats’ and they were trained by their partner APOPO. And do you know what? They worked! Those rats scuttled about, sniffing here and there, and then they would stop, smell the air, and then scratch the ground. That means they found a landmine! CMAC said that the rats were fast and had really speeded up their work. So together CMAC and APOPO had helped many communities. Less than two weeks later, our fields were free of landmines. Our kids were safe, our fields full of growing crops. We need to give all our thanks to CMAC, APOPO and those speedy HeroRATs!